Rendezvous Lunch Club – next one Tuesday 23rd April! 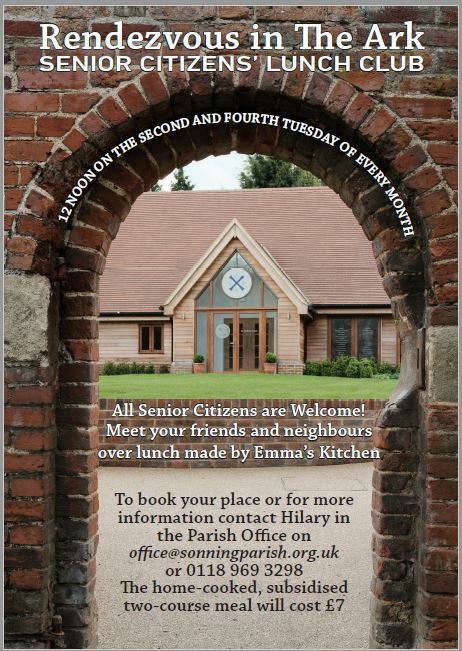 The next Rendezvous Senior Citizens’ Lunch Club will take place on Tuesday 23rd April. Enjoy a home cooked, two course lunch by Emma’s Kitchen in Twyford for the subsidised cost of £7. Why not book? It’s a great opportunity to meet with other people and enjoy good conversation over lunch. Please phone Hilary in the Church Office on 0118 969 3298 or email office@sonningparish.org.uk to book a place. If you have difficulties getting to The Ark, do call the office and we will do our best to arrange a lift for you. See full details below – we look forward to seeing you!